LIMITED* TICKETS ARE AVAILABLE NOW! RESERVE YOUR PLACE. ‘THE HUNGRY DRIVER’ – Track Day Ticket only (excludes access to Buffet Lunch). ‘THE DRIVER DINER’ – Track Day Ticket and Buffet Lunch included for Driver (normally +£30pp) in the exclusive Jackie Stewart Pavilion, plus complimentary Tea and Barista service all day long. ‘THE DRIVER DINER PLUS’ – Track Day Ticket and Buffet Lunch included for Driver and an additional Guest (normally +£30pp) in the exclusive Jackie Stewart Pavilion, plus complimentary Tea and Barista service all day long. For its second year, StangFest is shaping up to be bigger and better. Still the same exclusive opportunity to test your pony on the legendary Goodwood Circuit, but now with three cheaper ticket options and much more activity off the track throughout the day, including a static display and prizes to be won. The top 105dB static / 101dB drive by decibel noise limit means you can really open up your throttle on track. UK’s official Mustang Only event at Goodwood Motor Circuit. Guaranteed small groups of around 10-15 cars on track at any time. 2nd Driver goes FREE plus additional guest passes available for a family-friendly day out. Great for novice and veteran track day drivers – you’ll get as much time as you want on this safe, fast, circuit. Free Helmet hire. Lockers/Changing rooms. Open Pit, subject to safeguarding. Receive driving tips from Goodwood’s professional instructors, subject to availability. 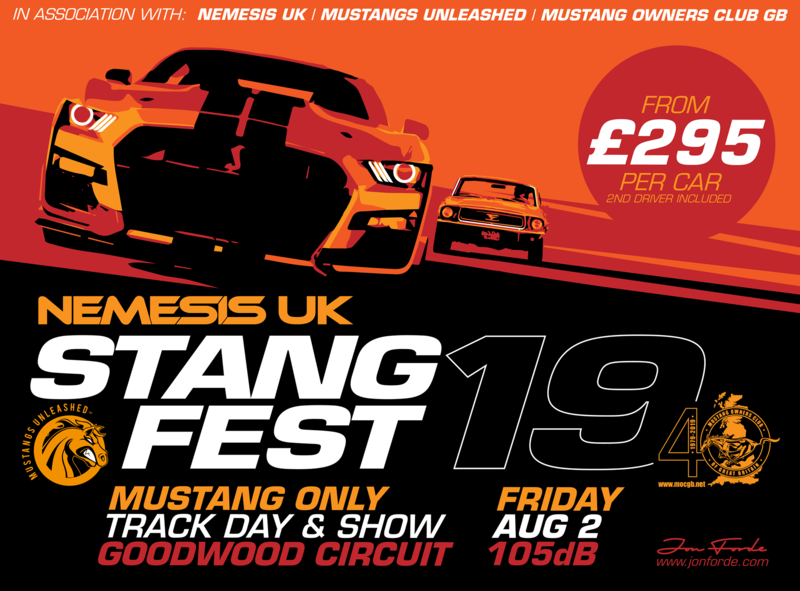 This year’s event is being sponsored by Nemesis UK and Mustang Owner’s Club GB – watch this space for the added extra’s they’ll be serving up on the day. StangFest artwork designed by Jon Forde. * All on First-come, First-serve basis from a total of 40 tickets. Lunches limited to 50.